I know blogs are passé and no one really follows/reads them anymore. However, I’ve been doing a lot of development in Xamarin lately and running into new (to me) problems every day, so I’m going to document them here and help the SEO world to find the answers again in the future. And, I’ll try to remember to throw in some stuff about the books I’ve been reading and other interests now and then. I’m uploading my Visual Studio 2013 Quality Tools presentation here, even though it’s not that useful without the product demos to go with it. I guess it’s primarily reference materials for those who have actually seen the presentation. Maybe I’ll do screen-shots later and embed them to make it more stand-alone. First, select the Network tab on the top menu bar. This shows you the list of all of your contacts. Unfortunately, the list is in no particular order. So the next step is to change the sort order by clicking the down arrow next to Sort by and selecting New. This will put your latest connection at the top of the list. Now you have two options: (1) Check the box next to the contact you want to remove, then click the arrow next to the top More option. There you can select Remove connection from the drop-down list. 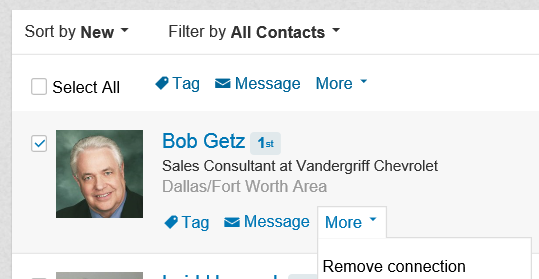 (2) Alternatively, when you hover over an individual contact, a menu of options appears at the bottom of the contact item. There you can click the arrow next to the lower More option and select Remove connection from the drop-down list. That’s it! You have successfully removed your spam contact. Yesterday and today I had problems downloading new apps from the Windows App Store on my Windows 8 tablet. I finally found a post in the Windows Forums about resetting the App Store Cache. Basically, run this utility from the command line or Start | Run menu.